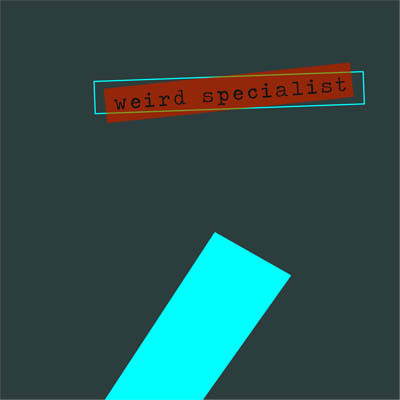 „Weird Specialist“ is a release of solo recordings by Rainer Thelonius Balthasar Straschill, stemming from the time of his last solo release, Neinnein auf dem kleinen Weg, up to the end of 2007. Like “Quelques Papiers D’Abord”, this album has also been released under creative commons license on jamendo.com. Like all of Straschill’s album releases since 2001’s "groxis tafelbilder", “Weird Specialist” focuses heavily on the use of live looping technology and relies solely on freely improvised material. In contrast to the preceding albums, it does however have more of a compilation approach in so far as it is assembled from a pool of two-track recordings, some of which have been combined to form entirely new pieces, thus revisiting a technique which in the past led to works like “Metamorphosen, Leere Bierdosen” (contained on JANUS) or “Shotgun Mulligan” (released on Krispen Hartung’s Xperimentus). While not an a priori goal for the album, the majority of the music is actually groove-based, hereby documenting Straschill’s shift to lower bpm rates in the range from 87 to 106. As another important novelty, the album focuses on the use of the electric guitar as a lead instrument (and may be the last album to that respect for a long time) and is also Straschill’s first album (in a series of more to come) which has been created using his integrated computer-based performance setup exclusively. As diverse as the music is, so are the sources: two tracks (“The Streets” and “I left my Pants in San Francisco”) are live recordings taken from Straschill’s headlining appearance at the Y2K6 International Live Looping Festival, Santa Cruz. The track “Errico’s Grave” is actually the coda of a kybermusik session, recorded after Tony K had lost his internet connection. 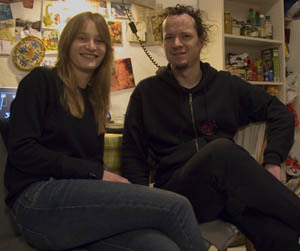 The rest are edits or assemblies from recordings done at Moinho HQ, in the case of the two-part title track taken from no less than ten individual pieces. For those people obtaining an actual physical copy of the album, there's yet another highlight: the cover art has been done - similar to that of the SAUBER! album - by famed designer Anna Bejenke. So for those among you longing for that gesamtkunstwerk approach a download can never accomplish, you just have to visit a Straschill concert - for now, the only place where these CDs will be sold! The entire artwork - of which the online release displays only the front of the booklet - takes its force from the contrast of minimalist design elements combined with intricate drawings. The album is available as a digital album download from bandcamp via the player on the left, or directly here. Small hardcopy quantities (together with stunning cover artwork) will be available for sale at Straschill concerts!